My husband and I are huge vegetable lovers… my kids? Not so much. But one day I discovered that when I pureed veggies into a velvety soup, all of the sudden they became HUGE fans. It was like magic. I’m not sure why this works but I’m just content knowing that it does. Here is a list of vegetables that my kids won’t touch on a plate but will devour if unrecognizable in a bowl. In a large stock pot or dutch oven, sauté the onion in a drizzle of olive oil. Once the onion begins to soften, add the leak (or any other vegetables you choose) and continue to cook. Add the liquid, peas, and thyme. Cover loosely with a lid and cook over medium low heat for about 2 hours, stirring the mixture every 20 minutes. Once the peas have softened completely, add the cauliflower and continue to cook until soft. You can always add more liquid to the soup if needed. Use an immersion blender to puree the soup until all of the clumps are gone. Season with a tsp of salt and ½ tsp of pepper to start. Add more if desired. My sous chef, Georgie. Another tip to get kids to eat healthy, let them help you make the meal! This is so filling and packed with nutrients, my husband and I get to enjoy a satisfying and healthy meal and the kids are happy too, total win/win. These soups also refrigerate and freeze very well, I’m always taking leftovers to work. A tip for enticing kids to try this out is to set up a soup “toppings bar”. Just put out bowls of homemade croutons, cubed ham, cheese, etc. They love the idea of customizing their own soup, it gives them some decision making power and let’s face it, everyone loves a good bar! 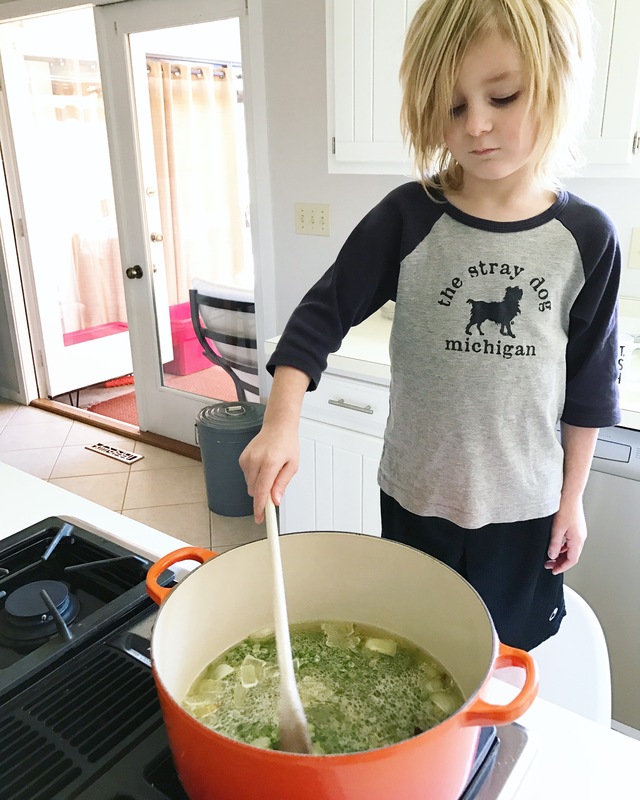 I hope you try this soup recipe with your family…you just might make some magic happen.